Mark Ladner, an executive chef at Mario Batali’s acclaimed Italian restaurant in Manhattan, Del Posto, has developed a gluten-free version of every pasta dish on the menu there — even the popular 100-Layer Lasagna. Now he’s bringing his creations to other parts of the country, launching a quick-serve gluten-free pasta concept called Pasta Flyer. He’ll begin with “pop-up” tastings along the East Coast this fall. He plans to open brick-and-mortar restaurants next year. Think of Ladner’s brainchild as the Chipotle of Italian cuisine. In fact, the idea comes from the fast-casual ramen noodle shops that are prevalent throughout Japan. Relying on his expertise at Del Posto, Ladner has developed five varieties of gluten-free pasta (made with Cup 4 Cup flour) that can be paired with different sauces, proteins and sides and served in less than three minutes. Diners in Boston, Providence, New York City, Philadelphia and Washington, D.C., will get to try the pasta bowls as part of Pasta Flyer’s pop-up truck tour, which begins in late September. “I’ve always been interested in the idea of inexpensive quick service,” says Ladner, whose resume includes two James Beard Foundation Award nominations for best chef in New York City. Pasta Flyer “started out as a hobby that got out of control,” he adds with a laugh. The idea for making the menu entirely gluten free came about after Ladner recognized that having a mix of gluten-free and traditional ingredients would reduce the efficiency that is a hallmark of the concept. 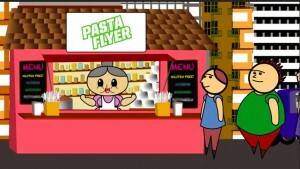 Pasta Flyer received support from 450 contributors as part of a successful Kickstarter fundraising campaign, which brought in nearly $90,000. Kickstarter is a website that connects creative projects with people willing to back them through contributions, so-called crowd-sourced funding. Contributors who want to see a project become a reality pledge amounts that can start as low as $1, and project creators often offer rewards as a way to thank contributors at various levels. The money contributed for Pasta Flyer will go toward continued research and development, equipment, employee salaries and other business expenses. Rewards for backers ranged from microwaveable gluten-free pasta meals to collaborative dinners with the chef in the tour cities. Ladner says proceeding with public funding, rather than early venture capital investment, has allowed Pasta Flyer to develop community support and compile demographics that will help to determine other pop-up locations and the planned expansion into restaurant sites in 2015. In the short term, Ladner is focused on reaching areas with large college communities, whose student and professional populations are target groups for affordable and healthful food. While the pastas and sauces will be made at a central gluten-free facility, Ladner plans to purchase vegetables, herbs and other ingredients from businesses near each Pasta Flyer pop-up location. In addition to a customized pasta bowl, each bento box-style lunch will also include a salad, snack and drink at a cost of between $10 and $15. Michael Savett is the author of the blog, Gluten Free Philly. He is also a regular contributor to Gluten-Free Living.